Getting to this finished cake, above, took a lot of planning and preparation! This is just part 1: my prep work. My friend/cousin-in-law/one of my best customers is always coming up with new, challenging cakes for me to make for her events. This time, her sister is getting married! It is shower time! She decided to go with a vintage lace theme, and sent me a photo of a shoebox cake. 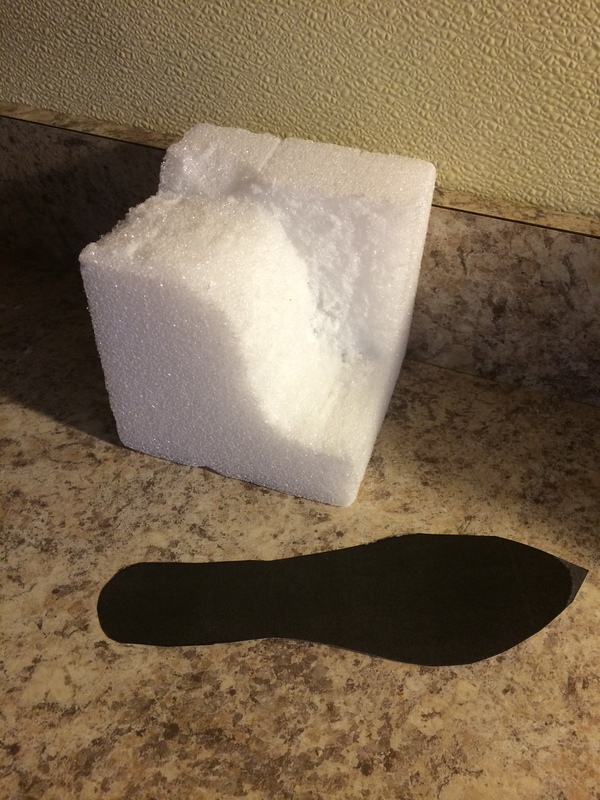 As soon as she wanted a gumpaste shoe, I started doing my handy-dandy internet research and came across this handy post: How to Make a Gumpaste Shoe by Sugar Teachers. My daughter and I headed to Michaels to see if we could find a styrofoam block, which isn’t what Sugar Teachers did, but I saw other posts about using styrofoam. My husband helped me to make it using a serrated knife. Then I played around with the template until it was just-right. 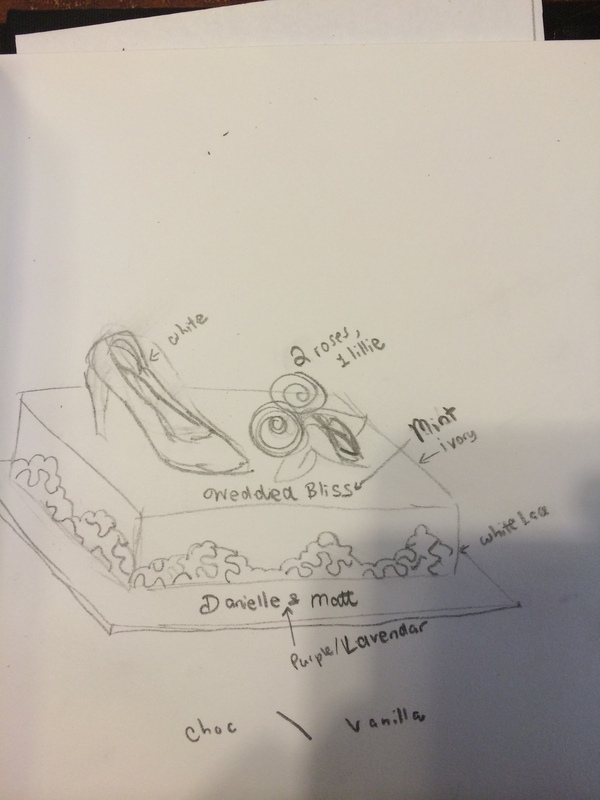 First I made the white part of the shoe, and decided to bring in the teal color from the invitation into the lining of the shoe. I couldn’t get the heel just-right, but figured it wouldn’t be seen too much anyway. I poked a hole in the bottom of the shoe so that I could put a toothpick in it later (so that it could sit securely on the cake when the time came). Next, I made my gumpaste flowers. This I wasn’t worried about because I have made plenty of them before. Once, I had to make almost 40 gumpaste roses for a wedding cake. That was so time consuming! But making just two was not. I made my buds for all four flowers ahead of time on toothpicks and let them set up for a few days. I use the Wilton method of putting together flowers. 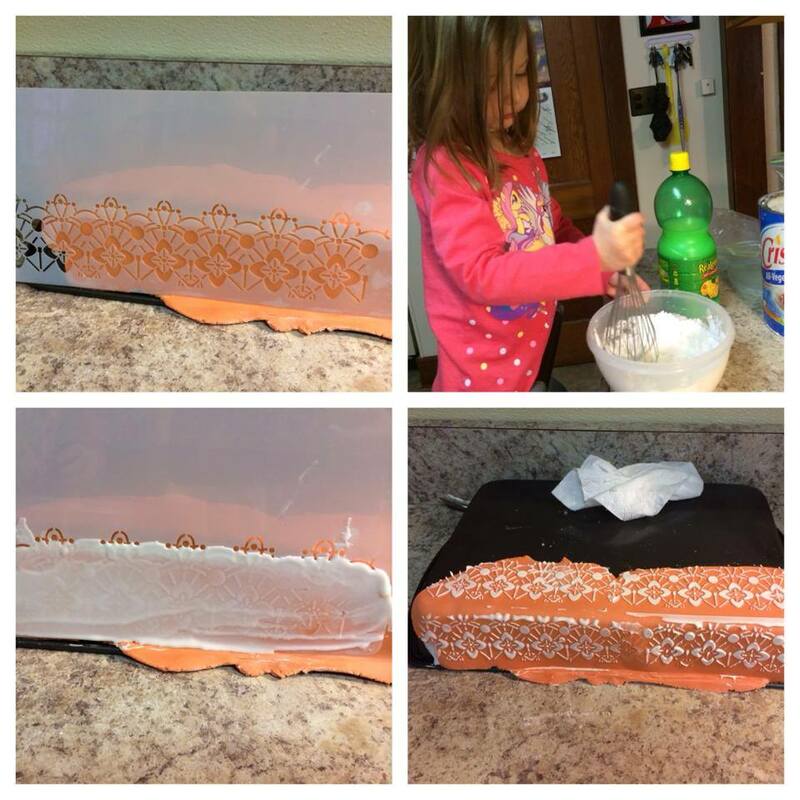 I told her about lace cake stenciling and found just the right one on Global Sugar Art.com: Victorian Crochet Stencil. I watched a bunch of videos and read a tutorial by Royal Bakery about how to stencil on the side of a cake. I wasn’t about to do this without practice the first time – especially not for such an important cake! After I got the stencil and cleaned it, I covered a cake pan with extra fondant and tested it out. 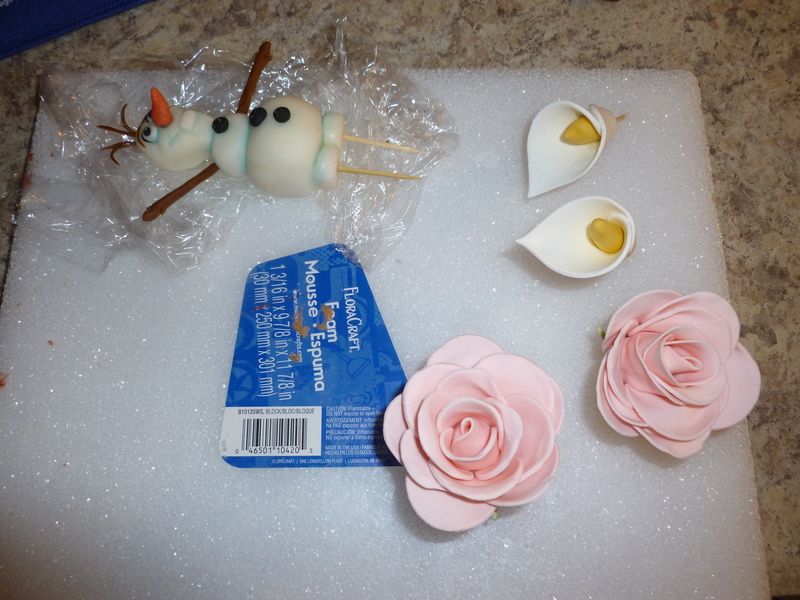 I was able to learn for myself how thick or thin my royal icing should be. After testing it out, I had my reservations on doing a rectangle cake and decided it should be a 10″ round cake. She wanted half-chocolate and half-vanilla, so I could easily do that with a 10″ cake. I prefer a recipe from King Arhur called “Golden Vanilla Cake” and my favorite chocolate cacke is Hershey’s Perfectly Chocolate Cake. But now I use a slightly modified version that uses a cup of coffee instead of a cup of water – it is delicious! See my post about how to make a half and half cake here. I also made my Tappit letters and leaves out of gumpaste. After all my prep work was done, the cakes baked and in the freezer, all I could do was wait until it was time to put it together. I’ll tell you more about the very-last-minute stuff in a Part-2 post. This is awesome! You’re so creative!